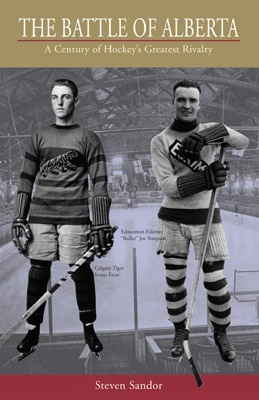 Alberta has long been a big part of the frantic Canadian hockey scene, and even before Alberta became a province in 1905, the intense hockey rivalry between Calgary and Edmonton was in full swing. Long before the glory days of the ’80s, teams from Edmonton and Calgary worked each other over with relish and passion, all the while creating a hockey rivalry unequalled anywhere. In The Battle of Alberta the rough-and-tumble relationship between two hockey hotbeds is presented in all its colourful glory. The century-long tussle got its start in 1895 when an all-star team from Calgary journeyed to Edmonton to take on the mighty Thistles and a team of North West Mounted Police pucksters. Calgary came away victorious, Edmonton vowed revenge, and thus began a long procession of battling teams in both cities: the Edmonton Eskimos (the hockey Eskimos featuring the renowned Eddie Shore), the Calgary Tigers, the Edmonton Superiors, the Calgary Bronks, the Edmonton Flyers (with Glenn Hall between the pipes), the Calgary Stampeders, the briefly named Alberta Oilers, the short-lived Calgary Cowboys, the Edmonton Oilers and the Calgary Flames. Great teams, exciting games, masterful players—hockey at its best.